This is the restaurant we went to for dinner after our second and final day of our work meetings, also conveniently within walking distance of both our Milan office and the hotel we were staying at, located on Corso Como. First, second and third, let me tell you up front, this is probably one of, if not THE, best meal I’ve ever had in Italy. And I’m including my previous trips to Florence, Rome and Venice in that group where I’ve had some pretty delicious and amazing food. This one topped them all. That’s saying something. So I will save myself from gushing about everything and repeating all the superlatives I can find – like tasty, superb, gastronomic delight, epic culinary peak, amaze-balls delicious greatness – by simply laying out what we had so that if you were find yourself in Milan, it will be worth every effort to find this restaurant and dine sumptuously. We had appetizers but I skipped those. You know I like to save room for dessert so I focus on entrée and beyond. At first I, along with the rest of my coworkers, waffled back and forth between the varied menu choices. Pasta? Steak? Some of us hadn’t had a good steak in awhile (my Holsteins burger didn’t count). There was also a risotto option on the menu that sounded good. 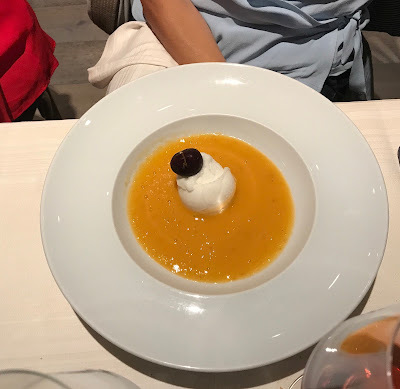 Simona, our Milan host, took pity on our indecision and negotiated with the restaurant staff to serve us a combination of dishes family-style. It was the perfect solution. First came the best risotto I’ve ever had in my life. Perfectly cooked, perfect texture, perfectly seasoned with saffron, perfect in every way. I could’ve eaten bowlfuls of the stuff. They served us each a European-sized portion (meaning an actual single serving, not the double or triple portions common in Americanized restaurants). I have to admit it left me wanting more and for the first time in Milan, I wish they did serve more like American restaurants. Gastronomic greed was winning out. 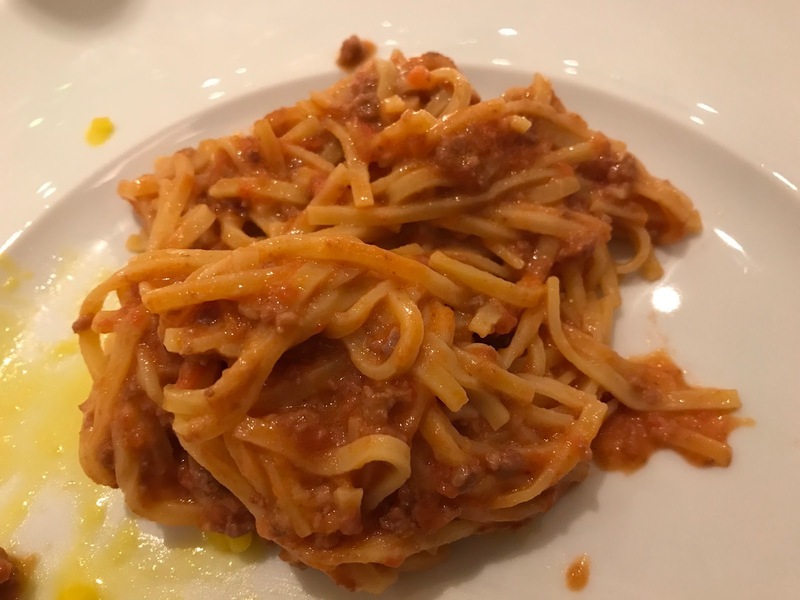 Fortunately, they soon followed with “fresh Tajarin pasta with piedmontese sauce” as the next dish to be shared around the table. If it was possible, it was even better than the risotto and definitely the best pasta I’ve had in my life (see the trend?). Fresh noodles perfectly cooked in perfectly cooked sauce. Amazing. I had another European-sized portion but this time I was grateful for it because now I knew to pace myself. Each dish coming out was so good and I had to resist the urge to overeat any one dish or else I wouldn’t have room for the next one. Which turned out to be one of the most perfectly seasoned steaks I’ve ever had. Yes, the trend for “best meal ever” continued when they sliced succulent slabs of beef tableside, seasoned it expertly (and perfectly) then served it. The steak was more rare than I normally cared for but it was so beautifully seasoned that I enjoyed every bite. It was carved tableside by a man I think was the restaurant owner or manager. Super friendly guy who really cared that we enjoy the food and drink being served by his staff. If you’ve tracked what I’ve eaten, so far I’d had the risotto, pasta and steak. Good thing I skipped the appetizers. Which left just enough room for a half serving of a delicious tiramisu. Normally I’m not a big tiramisu fan but I was in Italy after all and after that stupendous meal, I figured if I was going to have tiramisu in Milan, I should have it here. It turned out to be the right call as that too was an excellent tiramisu. Too bad by then I didn’t have much room left so I could only eat a half portion before I stopped myself. I was at just right level of fullness, meaning I didn’t hurt, so I could look back on the meal with fondness but not guilt at having overeaten. Okay, I ate a lot but I didn’t overeat. At least not by my usual standards. All in all, an incredible meal and for anyone who finds themselves in Milan, I highly recommend tracking down this restaurant and ordering the risotto or the Tajarin pasta or the steak. Or all three.